A Japanese right-winger kicks the symbolic statue of the victims of Japan’s wartime sexual slavery in Taipei, Thursday. Screen grab from the United Daily News. According to local media, members of the Tainan City Women’s Human Rights Equality Promotion Association and other activists shouted slogans, such as “Japan’s apology, Japan’s compensation,” after Mitsuhiko Fujii, a Japanese right-wing group member, kicked the bronze statue in Tainan on Thursday. The statue, which was erected outside Taiwan’s opposition Kuomintang’s office last month, symbolizes the victims of Japan’s wartime sexual slavery, also known as comfort women. 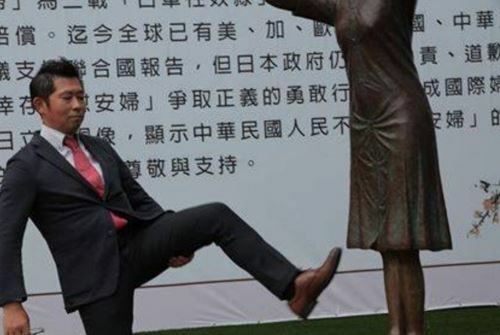 Security camera footage, which has been released by KMT Tainan City Councilor Hsieh Lung-chieh, shows that Fujii, who was reportedly visiting as a representative of Japan’s 16 right-wing groups, kicked the statue. Protesters urged Taiwanese authorities to bar Fujimura from leaving the island until he apologizes. They demanded he do so while kneeling in front of the statue. This is not the first time a comfort woman statue has become a vandalism target. In San Francisco, a statue was damaged and splattered by paint in the past few weeks. Many suspect Japanese right-wingers are responsible. As many as 200,000 Taiwanese, Koreans and many other Asian women were forced to work in Japan’s wartime military brothels. In Taiwan, there are two publicly identified victims alive today.